Mukteshwar Mahadev Temple is a famous temple of Lord Shiva located about 22 km from Pathankot city in Punjab, India. 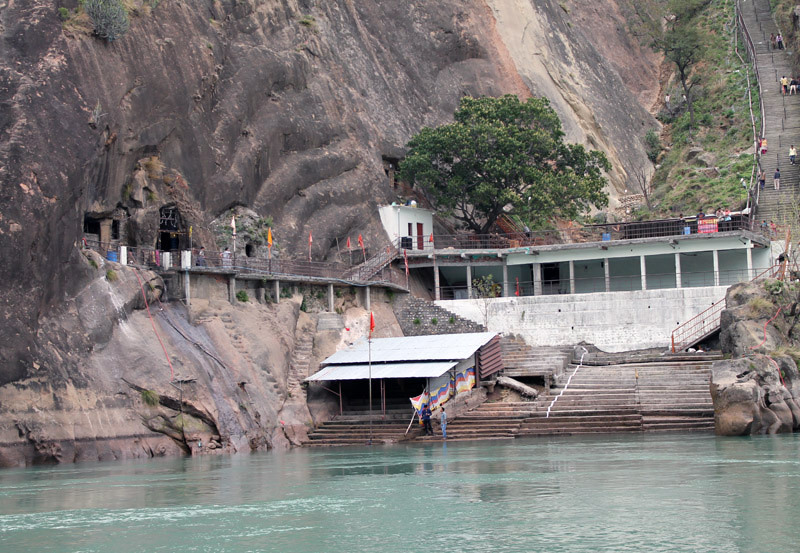 Also known as Mukesaran Mandir the temple lies on on Shahpur Kandi Dam Road, on the banks of Ravi River. The temple is a highly revered one among Hindus as the Shivling installed here is surrounded by idols of Lord Brahma, Lord Vishnu, Goddess Paravati, Lord Hanuman and Lord Ganesha. Another significant feature of Mukteshwar Temple is that there ancient old caves dating back to Mahabharata period. The 5500 year old caves and temple are believed to build by Pandavas during their “Agayatwas” that they stayed in these caves for six months. The Shivalinga enshrined in the temple was crafted by Pandavas for worship and the Havan Kund made by them is still present in the temple. Mukteshwar Mahadeva Temple is regarded as a mini Haridwar. Devotees who cannot do ash immersion of their ancestors visit the place and flow it in River Ravi. The temple caves and temple has been carved on one of the rocky hill and is a landmark around Pathankot city. Maha Shivratri is celebrated here with great religious importance. The 3 days Chaitra Chodiya festival celebrated after one month of Shivratri is also important. Mukesran Da Mela at Mukteshwar Mahadev Temple is an annual fair held to mark Baisakhi festival in the month of April. Many devotees make it a point to visit this temple on Shivratri. A big fair is held at Mukteswar Tempel on Somvati Amavasya. Navratri festival is also celebrated. Mukteshwar Mahadev temple is very well connected by road to nearby state Jammu and kashmir, Himachal Pradesh. It is just 22 km away from Pathankot, one can easily reach here by road. Maharana Pratap Inter State Bus Terminal, also known as Pathankot Bus Stand, is located just very close to the National Highway 20 that is at a distance of 3 km from the city. Regular buses from Delhi, Ludhiana, Jammu and Kashmir and Chandigarh ply from Pathankot. Raja Sansi International Airport in Amritsar (118 km) and Jammu Airport are the only nearest airports.